File photo Josie Faris takes time to spend with her hogs during weigh in on the Greene County Fairgrounds in 2017. XENIA — Ahead of the opening of livestock exhibits at the Greene County Fair, public health officials say hand-washing is crucial when it comes to keeping families and animals healthy. Schmitt advises guests to wash their hands before and after visiting a livestock barn, not to take any food or drink into the barns, and to leave pacifiers, bottles and strollers outside of the barns, as well. “Any time you take your hands to your mouth, there is a transmission of germs,” she explained. Schmitt said hand sanitizer stations will be available in the barns, along with reminder signs posted by the fair board. Restrooms are also available in the Assembly Hall, Dining Hall, and near Barn 2 and Junior Fair Board. “We actually prefer running water, [soap] and friction, but if someone can’t access that, hand sanitzer is appropriate. It does the job,” she said. GCPH officials list older adults, pregnant women, young children and people with weakened immune systems as high-risk persons who should consider avoiding animal areas. According to Ohio Departments of Agriculture (ODA) officials, frequent hand-washing can lower the risk of persons getting sick from influenza, salmonella, eColi and other illnesses. “Particularly with swine and influenza, pigs can transmit it to humans. It is rare, it doesn’t happen very often but it certainly can,” Schmitt said. According to a GCPH release, there have been 426 human cases of H3N2v from 2011 and 2017. The largest outbreak was in 2012 with a total of 309 human cases of H3N2v with 16 hospitalizations and one death. In 2017, a total of 67 infections were identified from 10 states. These infections included cases from counties adjacent to Greene County (Clinton and Warren Counties). Ohio’s fair veterinarians are trained to closely monitor fair livestock and poultry for clinical signs of illness. — Those who have swine on exhibit should limit the time their pigs are on the exhibition grounds to no longer than 72 hours. — Discourage “holdover pigs” held on exhibition grounds and exhibited at additional shows. — Discuss the use of swine influenza vaccines with a veterinarian and check the exhibition rules for any requirements. — Vaccines are available commercially and may be used prior to an exhibition as long as slaughter withdrawal times are observed as appropriate. Swine vaccinated for influenza may be less likely to become ill, and if they become sick, they may be contagious for a shorter time-period. — Become familiar with the clinical signs of influenza and other illnesses in pigs (off feed, lethargic, fever, nasal discharge, and cough). — Seek veterinary assistance if a pig becomes sick. — Understand the risks to both humans and animals of taking a sick pig to a show. Sick pigs need to stay home so they do not risk infecting other pigs or people. — Likewise, sick people can be infectious to pigs and other people. People with influenza-like illness should stay away from pigs and other people until they are fever-free for at least 24 hours without the use of fever-reducing medication. — Ask the exhibition organizer about any specific actions that may be required if a pig becomes sick at the show. — Clean and disinfect all tack, feeders, waterers, and show supplies before bringing them to the fair. — Allow at least seven days of “down time” (i.e. on-farm quarantine) after returning from a previous exhibition before showing a pig or pen-mates, to reduce the risk of spreading influenza. — Exhibitors who believe their animal may be sick should immediately contact their barn manager and fair veterinarian. Fair guests who experience illness should contact a medical professional, and their local health department. More information about safety measures can be found at https://bit.ly/2oQ41cr. For more information about Greene County Public Health, call 937-374-5600 or visit the website at www.gcph.info. 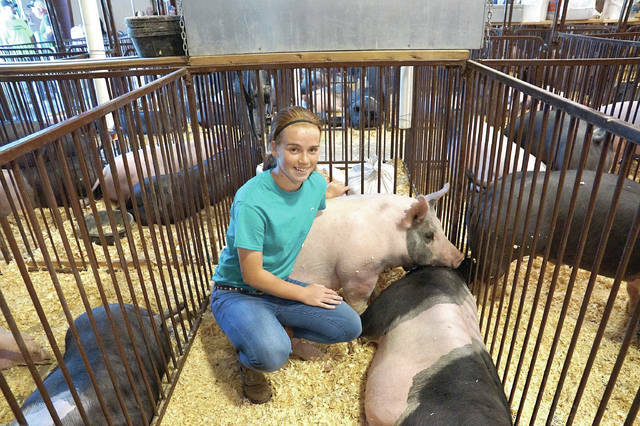 https://www.fairborndailyherald.com/wp-content/uploads/sites/50/2018/07/web1_Josie-FarisJamestown.jpgFile photo Josie Faris takes time to spend with her hogs during weigh in on the Greene County Fairgrounds in 2017.